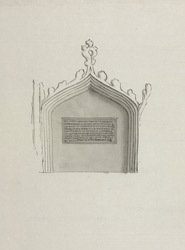 A drawing of a monumental brass in honour of the Fitz-Randolf family. This could be found between the pulpit and east window of the south aisle in St Wilfrid's church, in Kirkby-in-Ashfield, some five miles south-west of Mansfield in Nottinghamshire. The church building dates from the 12th century and a number of important families were connected with the parish. This brass monument commemorated Thomas Fitz-Randolfe (d.1593) and his wife (d.1598) who lived in Langton Hall in Kirkby.